An elephant that Gavin Belson used to make a point at a board meeting dies at Hooli Campus. When his assistant Patrice opposes Belson for getting rid of the 9-ton corpse in secret, she gets fired. Patrice contacts C.J. Cantwell to publish the story on Code/Rag. Richard finds out about Jared’s clickfarm operation with Dinesh and Gilfoyle telling him they know about it as well and producing software to make clickfarm operation undetectable, thus backing it up. 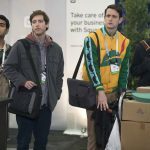 Oblivious to all of this, Erlich reveals that he managed to gather buzz over Pied Piper throughout the valley and attract a significant investment from Coleman Blair Partners, a venture capital firm. Jared encourages Richard not to sign the deal, as he will be effectively legitimizing fraud. When pressed to sign, Richard reveals the truth to Erlich and the Coleman Blair board, terminating the deal. Erlich gets furious, as the whole valley will now know that Pied Piper has faked its numbers, stripping it of all interest to investors. Laurie pulls away and puts the platform up for sale to the highest bidder. Anxious to get revenge on Richard, Gavin Belson offers $1 million to buy it and effectively extinguish the company. He also buys Code/Rag for $2 million in order to prevent the elephant story from spreading to the public. Monica, having been fired from Raviga for opposing Laurie, joins the team, which ultimately realizes that their video chat app, a side project by Dinesh, is considerably better than Hooli’s. Big Head and Erlich, who owned half of Code/Rag through their partnership firm Bachmanity, use the money they earned to beat Gavin Belson’s offer by one dollar, thus becoming the new owners of Pied Piper.